Who are my elected officials? / 거주지 선출직 공직자 확인 / 谁是我们的候选人? Am I registered to vote? / 유권자 등록 확인 / 我是否为注册选民? Where do I go to vote? 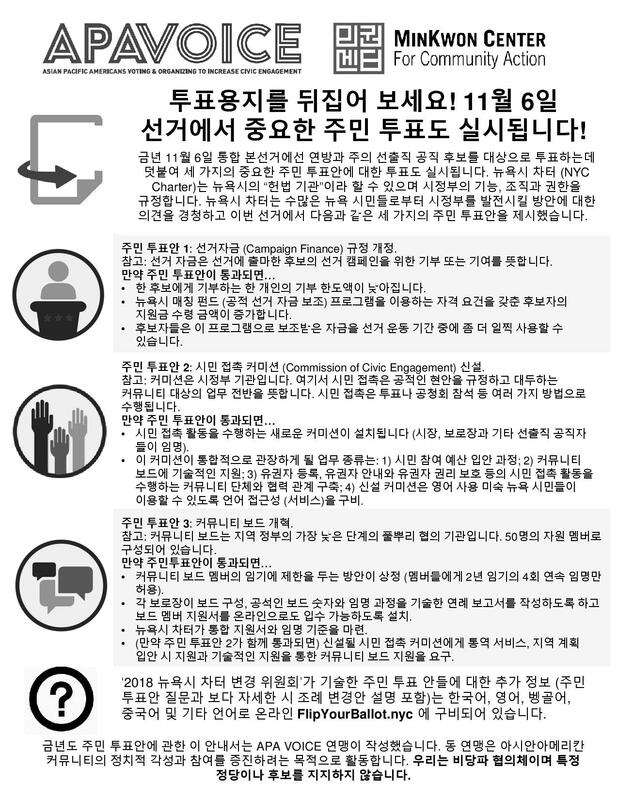 / 투표소 찾기 / 我去哪里投票? 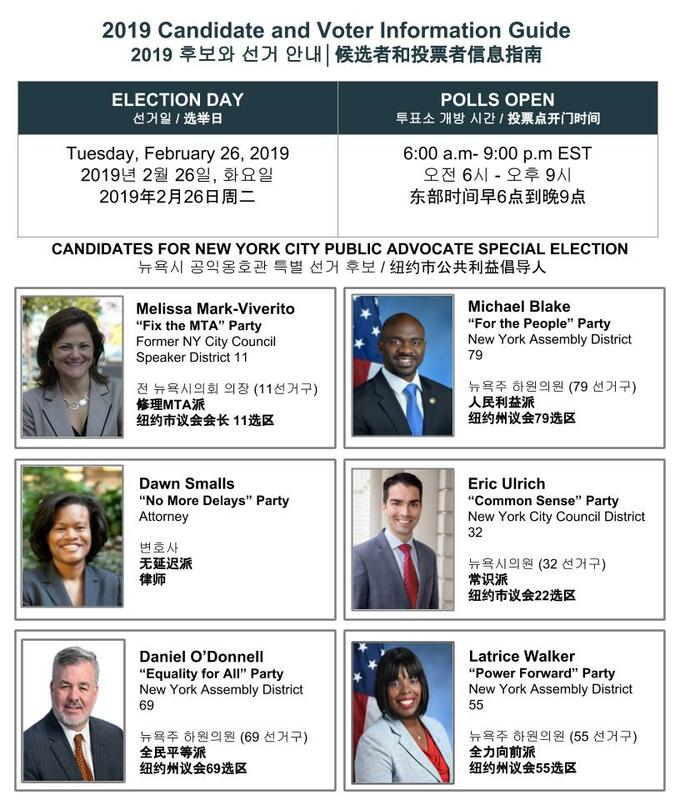 Disclaimer: This candidate survey for the 2019 New York Public Advocate Special Election was conducted and distributed by APA VOICE (Voting and Organizing to Increase Civic Engagement) for purely informational purposes. The candidates with campaigns having contributions exceeding $80,000 as of 1/22/2019 were contacted through email, provided the same set of questions, allotted a response limit of 120 words per question, and given a week to respond. For candidates who did not respond or refused to respond within the provided timeline, their positions were compiled from information available from the public domain, as cited. APA VOICE is non-partisan and does not support any political party or candidate. 이 2019 공익옹호관 특별 선거 후보자 설문 조사는 아시안 정치력 신장 연맹 (APA VOICE)에 의해 오직 정보 참고용으로만 실행되고 배포되었습니다. 2019년 1월 22일을 기준으로 $80,000을 초과하는 기부금을 보유한 후보자들에 한정하여 이메일을 통하여 연락하고, 같은 종류의 설문을 송부했으며, 답변은 120자로 제한하였고, 1주의 답변 시간을 부여했습니다. 이 후보자는 정해진 기한 안에 응답하지 않았기 때문에 노출된 공개 도메인에서 수집된 정보를 정리했습니다. APA VOICE는 비정당 협의체로 특정 정당이나 후보자를 지지하지 않습니다. 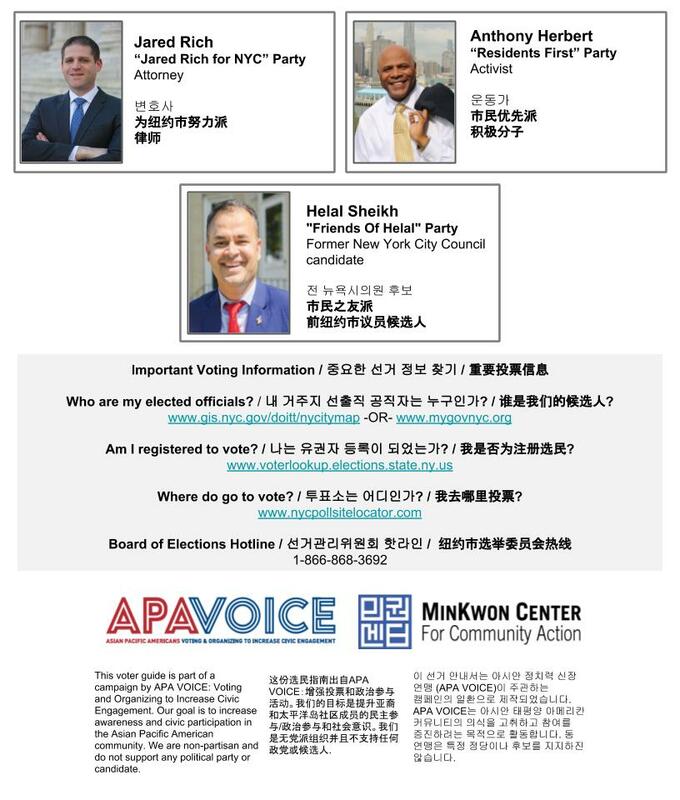 APA Voice conducted a candidate survey for the candidates running for the Democratic nomination for Governor of New York. 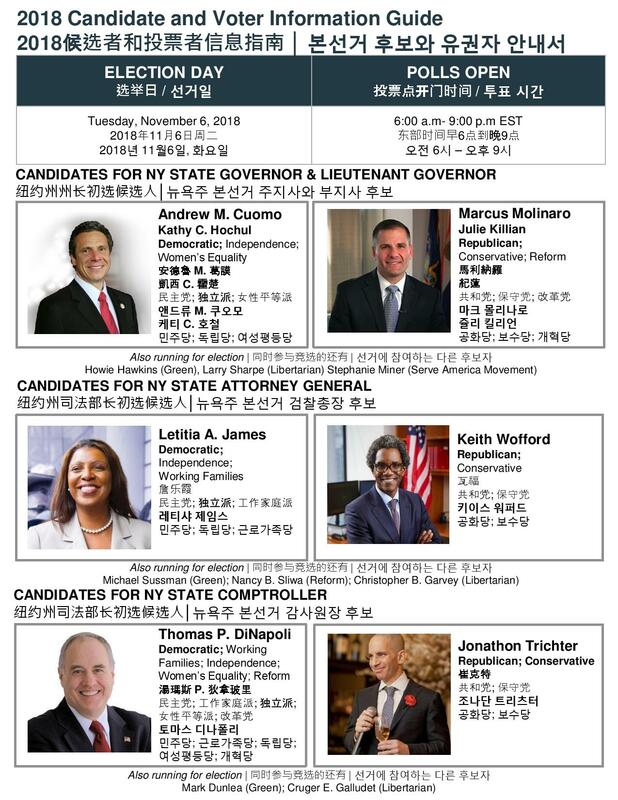 There are nearly 2 million Asian Americans living in New York State, and it is important they stay informed on the candidates running to represent them. The primary election will be September 13, 2018 and all registered Democrats will be able to vote. 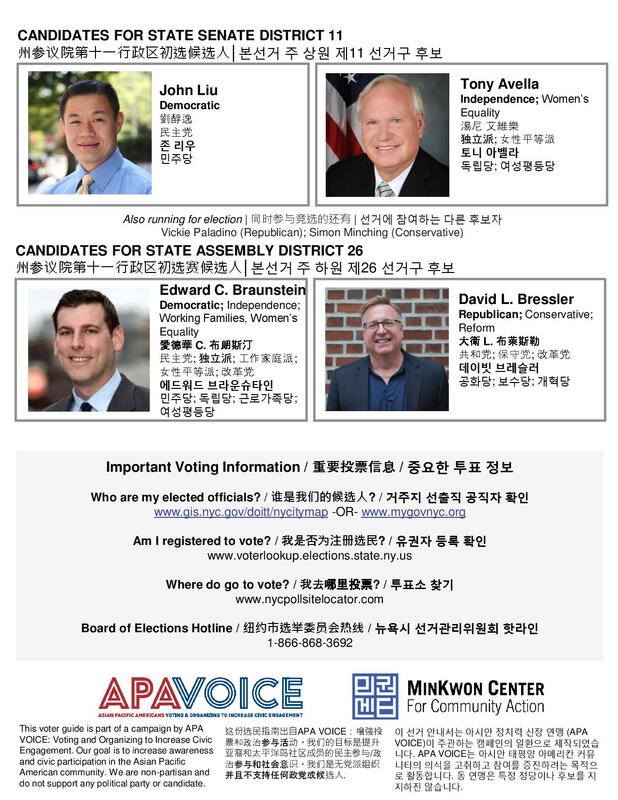 APA VOICE created and mailed a new voter guide to inform voters about what positions are being filled in the upcoming Primary Election as well as the election cycle. 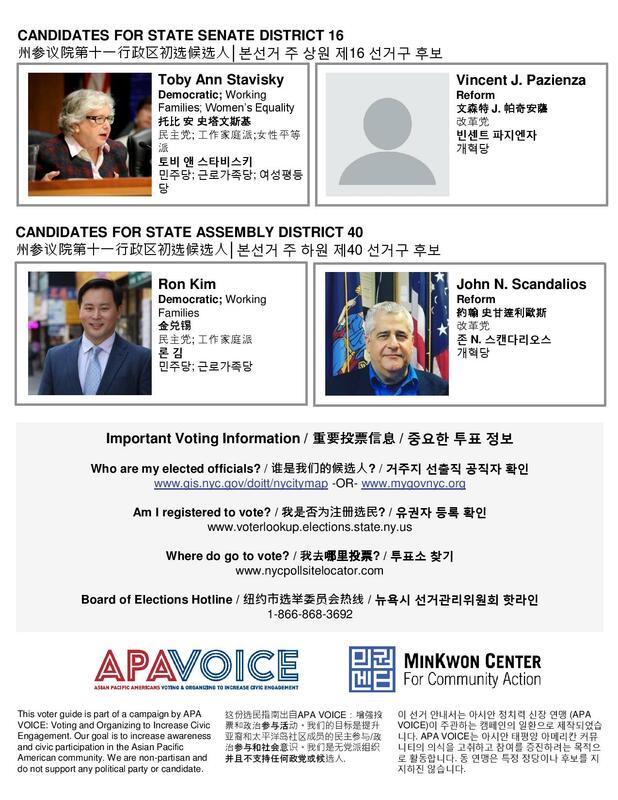 APA VOICE conducted a candidate survey for candidates in the 5th , 12th , and 14th Congressional Districts in preparation for the Tuesday, June 26 New York Federal Primaries. 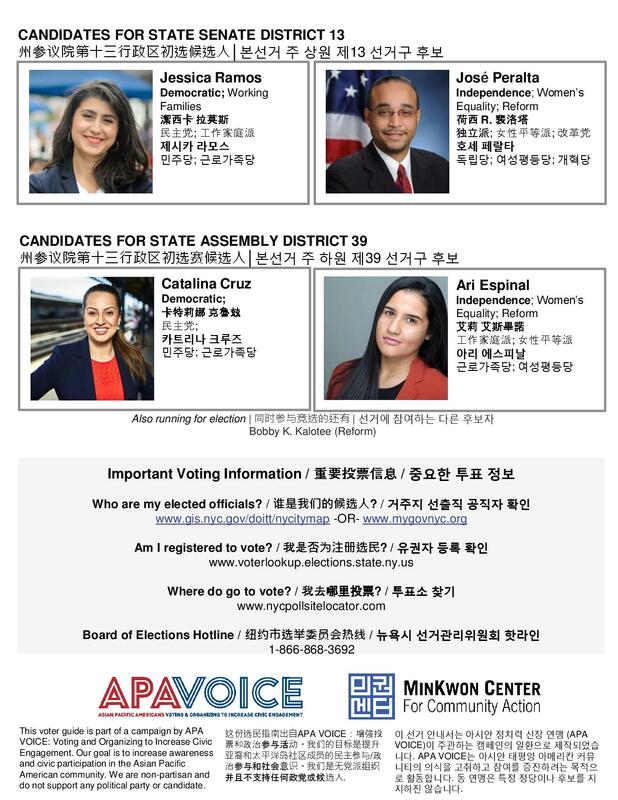 APA VOICE is a strictly non-partisan, pan-Asian coalition of 19 civic engagement organizations in the Asian Pacific American community and conducted the survey this month in an effort to increase voter awareness on topics relevant to the Asian Pacific American community. According to research by the Pew Research Center, Asian American voters have the worst turnout of all ethnic groups nationwide at an estimated 47 percent. According to the Census, turnout amount Asian American groups during the 2014 midterm elections was just 27 percent. 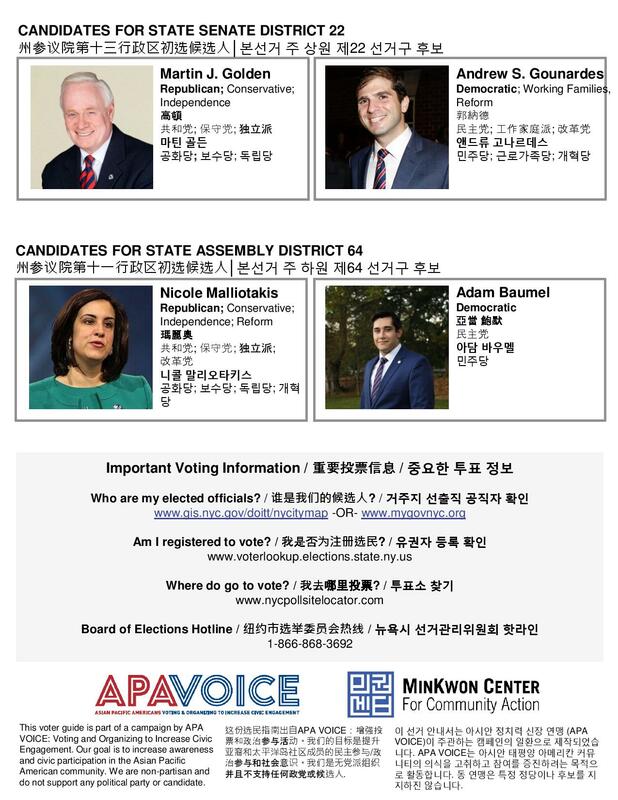 The survey is available in English, Korean, Chinese, and Bengali and can play a critical role in educating Asian Pacific American voters about candidates running in the primary election. 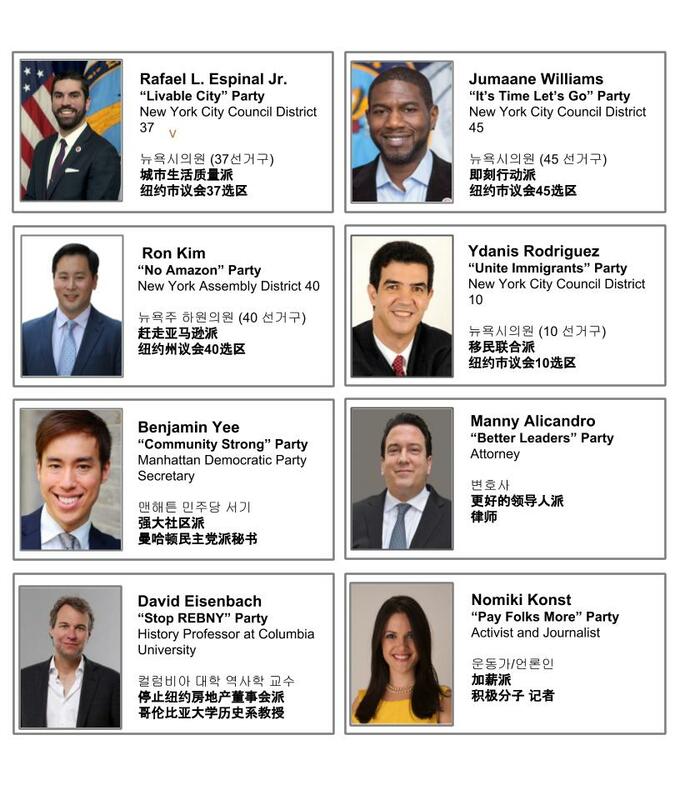 Because of lopsided party registration numbers, the primary elections are sometimes regarded as the “real” election in New York City, and it is important for the Asian Pacific American community members to stay informed about the candidates. The survey, which was distributed to all candidates of the 5th , 12th , and 14th Congressional Districts, posed a set of five questions on education, gun control, healthcare, immigration, and the 2020 Census in an effort to fully capture the positions of each candidate and his or her platform. All candidates were limited to 120 words per answer. 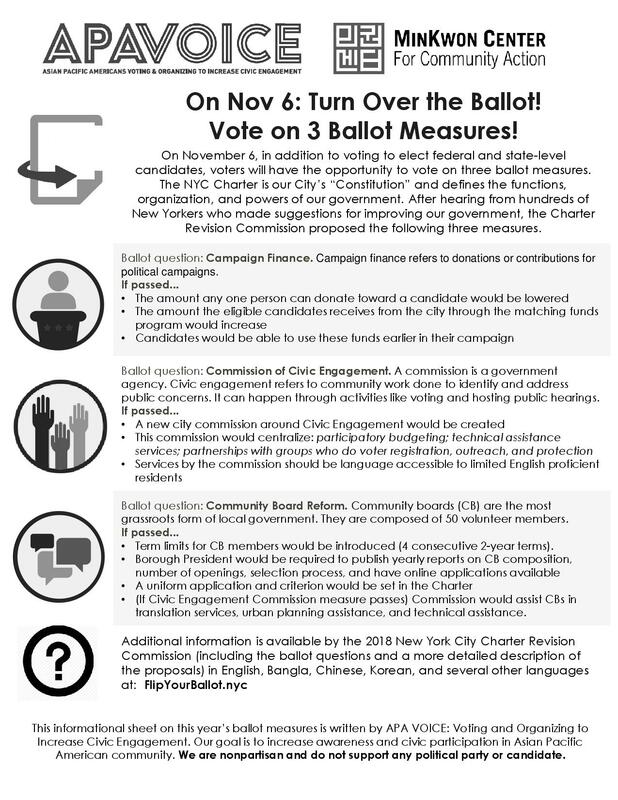 We made a voter guide and distributed it to approximately 15,000 voters in New York City! 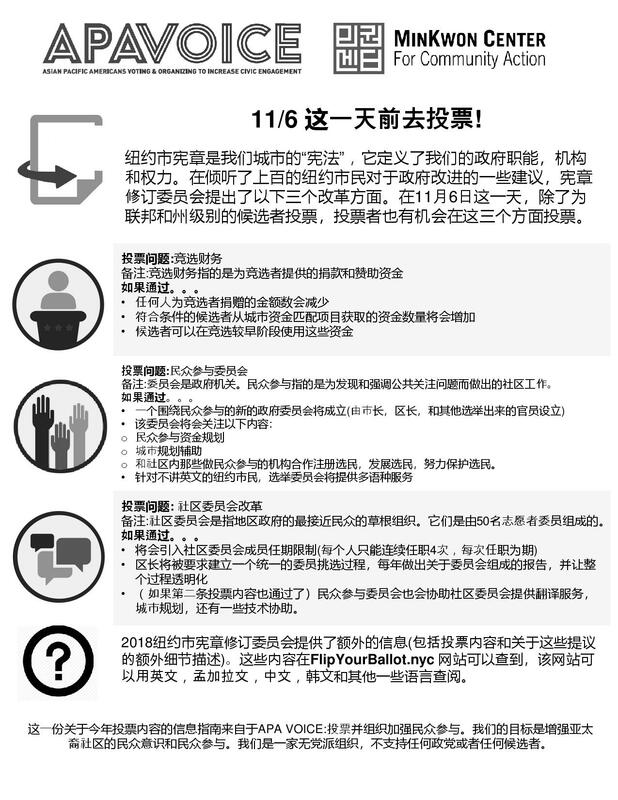 The guide is available in English, Korean, Chinese, Bengali, and Nepali.